Restriction: This exit is only available in File mode and in C language. The exit is called for each Output-Event to be written during the session. The Output-Events are read immediately after aggregation and passed to the restructuring exit. The Output-Events can be restructured and copied back in output. If an anomaly occurs in this exit, the session is closed. Called at the start of the session it initializes the module. Called just before writing Output-Events into the corresponding exchange area; it can be used to store, enrich and restructure the Output-Events read. Called when writing Output-Events to the exchange zone associated with the Processing-Context-Out, it can be used to enrich the Output-Events after restructuring. Closes the module and is called at the end of the session. The Output-Events are read physically until there are no more Output-Events generated. This entry point is called each time an Output-Event is read. 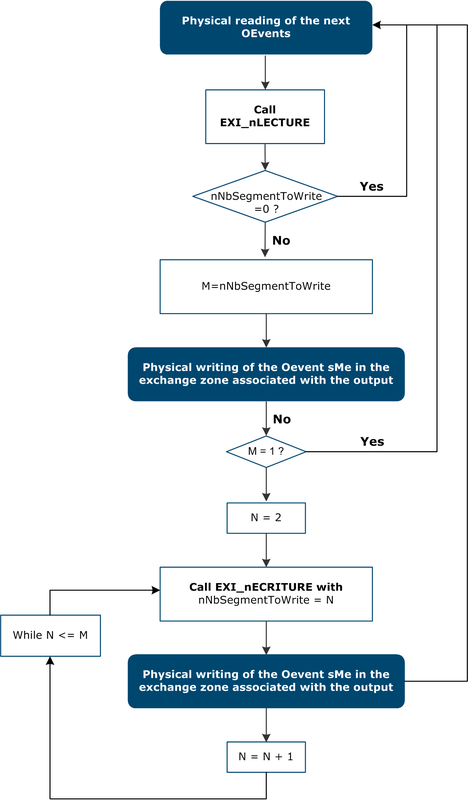 If you do not change the value of nNbOsegtToWrite in output, the current Output-Event (sMe) is written directly into the exchange area associated with the output. If you perform a further Output-Event read, you must store the restructured Output-Events in memory in the exit. Note Note: You can therefore execute N reads and one write, or inversely, one read and M writes. This entry point is called when writing each Output-Event restructured by EXI_nLECTURE. The value of nNbOsegtToWrite indicates the directory of the restructured Output-Event to be written. If necessary, you can change the content of the Output-Event, before returning it to the write module. This exit can be executed during step S.